As I walked in the door and down the isle, I felt an immediate sense of warm hospitality in the air. Hawai'ian dresses, flowers infused into many heads of hair, with the sweet sounds of Faith Ako's voice and ukulele floating through the theater carried a warm island feel into the Petaluma, CA. The center section of McNear's Mystic, usually arranged with standing cocktail tables, was filled with people lounging at lower, seated tables. The seats along the sides of the theater and the balcony were unusually filled this early in the performance, fans obviously enjoying the relax island vibes. "Auntie Faith" was singing beautiful, laid-back melodies - two acoustic guitarists accompanying her. It was a warm welcome. I was anxious to hear Justin Young perform. I had been hearing that he was popular, particularly in Hawaii, during the late 90's. He had taken a hiatus from his music career in recent years and I was eager to finally hear him sing in person. The crowd was pumped as well, cheering excitedly as he took the stage. Within seconds, it was clear to me why he is a Hawai'ian favorite. His extremely clear and smooth vocal tone with awesome range turned me into an instant fan. One of his first songs was a cover of John Denver's "Leaving on a Jet Plane" - a song in which lives many young memories for me. 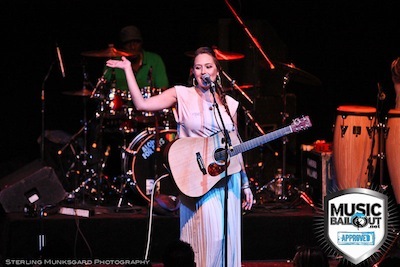 A skilled acoustic guitar player, talented songwriter and seasoned performer, Justin delivered an impressive solo performance, keeping the crowd captivated despite the fact that he was ill.
Anuhea, also sick with the flu, had cancelled her Park City show on March 31. I caught up with her backstage for a few minutes before she went on. She told me that, despite her sickness, she refused to cancel the Petaluma show and -- lucky for us -- decided to power through it. I was glad she did. She prefaced her performance by letting the audience know she was sick, but it was unnecessary. From the first line's of Estelle's popular "Come Over Love" the fans were captivated as always. Beguiling the audience with her laughter and obvious love for music, she has an amazing ability to draw each and every person in. Her fun-loving personality keeps us coming back for more. As the beginning chords to "Higher than the Clouds" struck, the crowd went crazy. Pure happy vibes flowed and the theater erupted into song with her. Her duet "Forever Summer" with Justin Young was pure bliss for me. Definitely my favorite song of the night. Had she not let the crowd know she was sick before she began, they likely would not have known. Always giving a stellar performance, Anuhea delivered yet again. As she finished her performance, I was sure she was done for the night and would not perform an encore because of her illness. But, ending the night on the ukelele with her gorgeous song, "Simple Love Song," she gave us dessert after a fine evening of musical delicacy.